Well played, Fiat. By paying attention to when Google's fleet of camera cars were snooping around Södertälje, where Volkswagen's Swedish operations are headquartered, Fiat zinged their rival good. How? By parking a Fiat 500 right in front of the front door when Google's Street View cars were out. What's great is that it's not just on the street in front of the building— the little 500 is right in the freaking doorway, almost under the awning. At first glance I was hopeful they drove it up the stairs, but it looks like there's a driveway there. 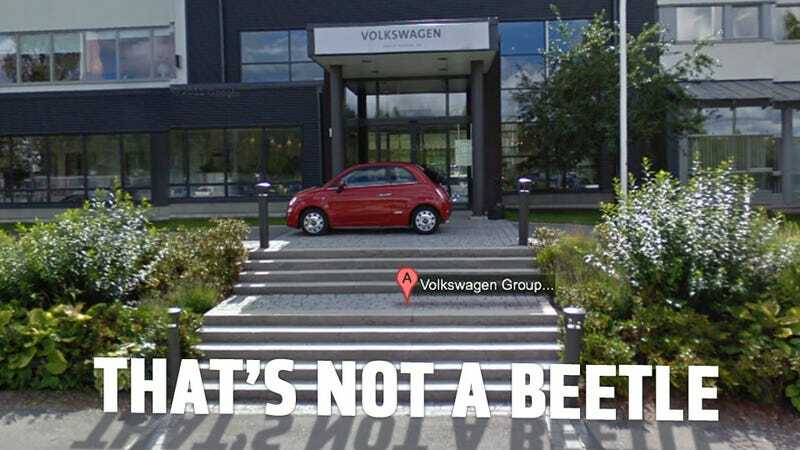 What's even better is that, based on Google's Street View updating cycles, Volkswagen will likely have to deal with that damn Fiat in front of their building for a year or more. The question is, how did Fiat know? Was it a chance sighting of one of the Google camera cars or does Fiat have a mole inside Google? Here in the US, Google uses Prii for their camera cars, but it looks like in Sweden they're using Opel Astras. So unless Opel and Fiat teamed up to prank VW, the tipoff wasn't from some direct Fiat-Google relationship. Pranks and cars have a long, rich history, so I'm hoping this leads to more. Fiat isn't commenting, but I'm pretty sure they're giggling. Good one. VW, this of course, means prank war. I suggest whoopee air bags.